17 fancy black first calf heifers with AI calves on their side by “Comrade” Angus bull. They started calving the last week in January. 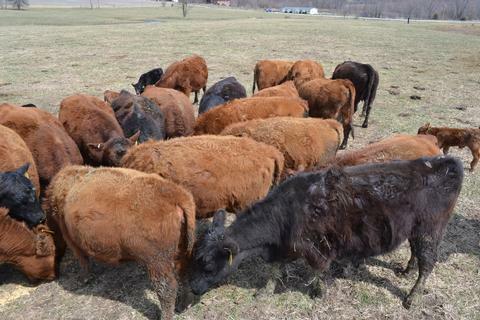 This annual consignment consists of black hided heifers from the Palmer herd in Center MO. These heifers consistently offer proven quality genetics with superior disposition. Heifers are unexposed for the buyer to bred to fit their prefrences. 40 First Calf Pairs. 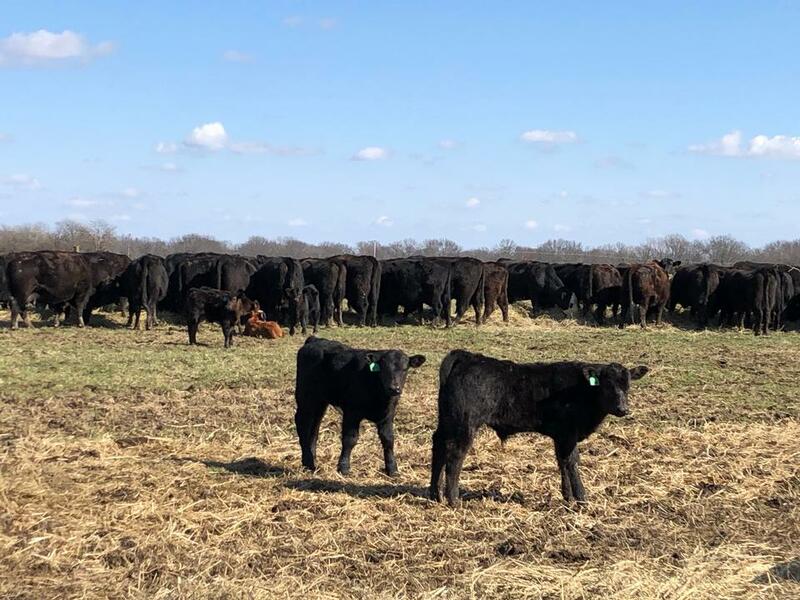 All heifers have gentle dispositions, been bucket trained and all around great mothers that originated out of Deer Creek Cattle Co heifer development program. Each heifer was given two scourguard vaccinations prior to calving and dewormed. Every newborn calf was given Multimin injection and CALF-GUARD (bovine rotavirus & coronavirus) vaccination at birth. Calves have been running to a creep feeder and unlimited hay. 21 will be red and black SimAngus heifers with half the calves sired ABS AI by either Connealy Front & Center or Andras Fusion and half will be sired naturally by Red Hill or Emerald Earth bulls. There will also be 19 Red Angus crossbred heifers that will have AI calves that came between Feb 29 and March 12 by the ABS Red Angus bull Andras Fusion. 66 Young Blk Pairs. 50 of these will have their third or fourth calf by their side by good SimAngus and Angus bulls. All these were originally calved as heifers or purchased as heifer pairs, all of which originated from reputable herds. 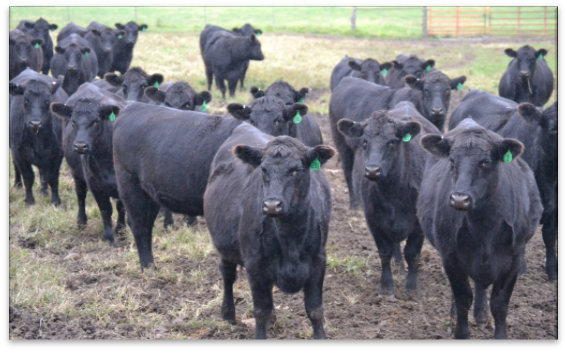 There will also be 16 black SimAngus heifer pairs that originated out of the Deer Creek Cattle Co heifer development program. They will have fancy AI calves by side. 12 registered and commercial cows bred to Simmy bulls. Spring calving, 3-6 year olds. Details and pedigrees at www.rinker.com and will be added to our website. 21 Cows. These will be mostly be black cows with the bulk running between 4 to 8 years old. The have been mated with either a good Red Angus bull with Mushrush genetics or a Black SimAngus bull with a Remington Lock n Load genetics. These should be in the third period or possibly a few calves by side at sale time. 23 Cow Dispersal These black cows will lean to the young side with 13 from 2 to 4 years old with the remaining 10 up to solid mouth. There are 7 cows with big calves to be split and few more to sell with new calves by side. 10 heifer pairs. These heifers will all be black hided out of Connelly bred bulls, wormed with Long Range poured with Ivermectin and had their vaccinations including Express FP 3-VLS, 20/20 Vision 7 with Spur, ready to go to grass. They have been unexposed for they buyer to choose time and bulls to fit their program. The calves are by a Sydgen bull of Fate breeding that all came in a 10 day period starting the 15th of February. The calves carry an ear tag to match their mom and have all had a round of vaccines including Inforce 3, Pyramid 5 + Presponse SQ, 20/20 Vision 7 with Spur. 8 Red Angus X Gelbvieh Pairs. 3 first calf heifers with March calves by side. 2 five year old pairs, 2 six year old pairs, and 1 seven year old pair with December calves by side. All red hided and home raised. 20 Bred Heifers. These will be fancy black hided heifers calving now and should be finished calving third of May. 9 Spring calving dispersal. These will all be black hided pairs with Feb and March black calves many of them coming with their second or third calf. Many originated as Show Me Select fourth tier heifers. These are unexposed and a dispersal of Spring calvers to concentrate on a fall herd. 50 Pairs. These Cows approximately 60 percent black and black whiteface with the balance being red and red whiteface with up to around ten percent Charolais crossbred. They will be native cows from NE Missouri and Western IL of running ages, mostly three to seven. This consignment will be weather dependant. Several Breeding Bulls to be offered starting shortly after 3 pm. 1 18-month old Registered (AAA 19131812) Angus (Schaff genetics) bull with a good breeding soundness exam that is ready to go to work. He comes with a 70 pound birth weight. 1 Angus Bull. Jerry likes the bull but is keeping heifers back so the bull is got to go. This bull, Musgrave 316 Lodestar (Reg: AAA 18467517) is three years old and has a good disposition and will have the breeding exam and trich test preformed the week prior to auction. 2 Angus Bulls. The first bull Schnarre B 732 is a 24 month old virgin bull that was sired by the bull KG Country Road. The second bull is an 18 month old virgin bull sired by KG Boda Bing 0005. The sire’s EDP’s: CED +10, BW -.10, WW +50, YW +93, Milk +20. Both bulls are out of good purebred Angus Cows. 2 RA bulls. These will be two registered 2 year old bulls with Andras genetic influence. Wimsett Trophy Baguette 76 (RAAA# 3769751) will be a calving ease bull with growth potential. EPD’s: BW -1.1, WW 44, YW 73. Also Wimsett Bando Jubilee 78 (RAAA #: 3769747); EPD’s: BW-0.2, WW 63, YW 103. 3 Simmental Bulls. These will all be registered, black and polled from 15 to 24 months of age. One caries genes from Bottomline and two have Relentless in the pedigree. They will have their breeding exam and Trich tested to be ready for use with individual details at www.rinker.com and at EMCC website. We have numerous consignments pending…. Any dairy cattle, including steers but excluding animals for slaughter only, are required by the State of Missouri Animal Health Dept to have a negative TB test. If such animals arrive at EMCC without this test, they will be quarantined a week and tested at sellers expense or sold strictly for slaughter only. We don't make the rules, but we are required to follow them. I plan on trying to put more info on our EMCC website or if you have dairy cattle you wish to sell in Missouri you can contact me and I can try to advise on your individual situation. Al Orf Jr. representative photo from early years consignment.